When my husband Sean and I found out we were expecting a child together a few months after getting married, we were both surprised and excited. We have a wonderful five year old boy, Noah, who is mine from a previous marriage. We've enjoyed parenting him together and were excited for Sean to experience pregnancy and birth this time around. 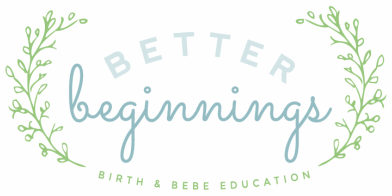 The first thing we did was start looking for a home birth midwife and a doula. We were disappointed to discover that the home birth, in the state of Mississippi, is not covered by our insurance policy. So, we decided our best route was to labor at home for as long as possible and birth at the hospital with our sweet doula, Bianca. Sean was so loving and supportive of me in whatever I felt I needed to do. Noah's birth did not go as planned. Of course, as many of us find out, you cannot plan a birth. But, I had prepared for a natural birth and ended up with stadol followed by an epidural. His labor began with my water breaking followed by only seven hours of hard contractions, one on top of the next. Afterward, I felt disappointed, as though I'd missed out on something important. My son, Noah, was born beautiful and perfect, so for that I was very thankful. However, many of my desires were ignored and I was bound to the bed the whole time. My recovery was also very difficult. But, the worst part was that the drugs had made me too hazy to truly enjoy the initial bonding time with my sweet boy. So, I'd resolved that if we were to have another baby, I was going to do everything in my power to have the birth I'd so hoped for. With this pregnancy I had a feeling baby would come early. I'm not sure now quite why I held this belief. It can likely be chalked up to wishful thinking! So, when I began having false labor many nights from about thirty-seven weeks on, I thought it was a sign that I was correct! I was wrong. We also were concerned that he may come very quickly because my first birth had been so fast. That was also not to be. Around thirty-nine weeks my Braxton hicks contractions began to come more frequently and last longer. There were a couple nights that I almost called Bianca, but held out. I'd been making poor Sean crazy by nesting for quite sometime! But, on the evening of my due date, I really gave the house a good cleaning as I had a sense of something happening. The next day was Easter and so Sean and I colored eggs with Noah and got his Easter basket all ready. We finally got eggs hidden near midnight and I noticed the crampy contractions seemed pretty consistent along with some pressure. I went to the bathroom and sure enough, there was bloody show. I excitedly told Sean we may have an Easter bunny! I sent Bianca a text to let her know what was going on and told her I had a feeling that this was it. She let me know she was ready whenever I wanted her to join us at the house. I told Sean to feel free to get some rest and that I'd join him after a shower. I figured it would be best to get cleaned up now before things got too intense, or we had a new baby! The shower felt so good, and relaxing that I didn't want to get out. I continued having crampy contractions every 3-5 minutes that were mildly uncomfortable. After my shower I dried my hair and put on minimal, comfortable clothes thinking of getting some sleep. That was much harder than I expected even though the contractions were very manageable. I kept dozing off a bit and then another stronger one would wake me up. I continued on that way for a while then decided to go into the living room so I wouldn't disturb Sean. The house was dark and quiet and I bounced on my birth ball for a bit and sipped some hot red raspberry leaf tea. I'd become accustomed to doing this each night and it felt right. Things stayed steady. Contractions varied from about forty-five seconds to over a minute long and still three to five minutes apart. I breathed through them with deep abdominal breaths and released slowly. Each breath, I focused on filling my lungs and expanding my abdomen completely. These made the contractions so much more manageable. Eventually, I began to feel sleepy again and so I placed a towel down on the couch, in case my bag of waters went,and laid on my side to get some rest. I found this position to be quite comfortable for most of my labor. I dozed in and out and scrolled through my phone reading intermittently for a several hours. Around four that morning I had several contractions that peaked twice and last for two or three minutes long. At point I started feeling shaky, chilly and kind of nervous. I thought maybe my body needed some extra calories for energy, so I got up quietly and went into the kitchen to find a snack. I settled on a couple of the Easter eggs we'd hard boiled and a clementine for some quick energy. While I was standing at the counter eating my snack I had several pretty uncomfortable contractions. I found it helpful to lean onto the counter and drop my knees forward. I'm not sure why this is so helpful, but I've heard other mothers talk of doing it too. After my snack I felt a bit better. But still a bit chilly, so I tried going and curling up next to Sean in bed. He woke briefly and asked how things were going and if I needed anything. I told him I needed him to rest now so he could be my support when things got hard.. But suggested letting our friend John know I was in labor because he was watching Noah. He was in Panama City, a few hours from us, but said he'd head our way shortly. Sean held me for a while and I felt warmer and less shaky. I was finding that I needed to vocalize a bit to help myself relax through the contractions at that point though. So, I wrapped up in a warm blanket and headed back to the couch for a while as not to disturb Sean. Around nine, I went to the bathroom and noticed a lot more mucus and bloody show. Going to the bathroom was not fun, but extremely necessary. You need to stay hydrated, so you're drinking a lot and if you don't empty your bladder frequently, things get extremely uncomfortable. I updated Bianca with my progress again then. Sean and Noah were getting up and so I watched Noah get into his Easter basket. We explained to him that I was in labor with his brother. He, of course, was very excited! I reminded him that mommy needed rest and quiet during this time and told him I'd be in our bedroom. They went about the morning as usual. It was dreary and rainy out, so our room was nice and dark and I found it easy to curl up and get cozy with the soft comforter and body pillow. Things seemed to slow down and space out a bit and I listened to some of the relaxation tracks I had downloaded which always helped me. I debated doing things to help things pick up but, figured since if not slept much and might not sleep much for a while, it was best to let things progress as they would. My Braxton hicks were always stronger at night so I figured my hormone levels were higher then. My sister, whom I'd been chatting with on and off agreed, and Bianca said she'd seen this before and to rest. I was able to doze in and out again, which was great. A while later Sean came in and asked how I was doing and mentioned running to the store for a few things. I reassured him I was doing well and was going to rest. He brought in a snack for me and filled my water bottle with some labor aid he'd made and he and Noah ran out for a bit. I think I slept the whole time they were gone, which was about an hour and was just what I needed. When I woke up, I went in and took a dose of the gentle birth tincture I'd been taking twice a day. I hadn't taken it yet that morning and figured maybe that would help things strengthen back up. I was feeling better rested by then and I was ready for things to get moving again! I stopped at the bathroom on the way back to the bedroom and had a couple stronger contractions while there. During those I would lean onto the sink as I'd done in the kitchen earlier and just moan through them. It helped me stay relaxed. This became a pattern each time I went from them on. I let Sean know that things were picking back up and I'd like his company. He put a movie on for Noah and came in to join me. He read me funny stories from his Reddit feed to make me laugh, which is something he does a lot. During contractions he'd stop and hold my hands or rub my back. Eventually, it got to the point where I could no longer relax easily. I was tensing my body and Sean had to remind me to breath deeply as I had been. He told me how amazing I was and that I could do this. I texted Bianca and told her I would need her soon because things were getting more intense. Sean got the birth ball and brought it into the bed for me to rest on. I kneeled and draped my body over the ball. Between contractions he reminded me to take drinks of the labor aide and during them he would get behind me and place pressure on my hips or firmly rub my lower back. This helped a lot. However, within about thirty minutes, I let Bianca know it was time for her to head over. I had planned on taking homeopathic doses of arnica to help with swelling and discomfort after birth, so Sean went ahead a gave me a dose, since it seemed things were getting close. Our friend John had made it back earlier and Sean let him know now that he should go ahead and come. aBianca arrived around 7:00pm and I was in the same position with the ball in the bed. She came in quietly and asked me how I was doing. We talked and laughed a bit between contractions and I told her I felt glad that things had progressed slowly as it was so much more manageable than Noah's labor. I'd had time to ground myself and get a foothold. I told her I had really wanted to be in the water but was afraid I wouldn't want to get out to go to the hospital. I think moving also seemed intimidating at that point. Things were getting more intense quickly and a couple contractions later Bianca encouraged me to move to the tub. I agreed and Sean went to get the water going. John got in around seven-thirty and kept Noah company, which was wonderful and allowed Sean to focus on supporting me. He came back and helped me change into my swimsuit that I'd packed. There was some difficulty finding this in the hospital bag and we were all laughing a bit about it. When I got to the dimly lit bathroom I knew I should use the toilet first as I'd been drinking a good bit of fluids. That was really not fun! But, as I lowered my body into the warm tub, I felt instant soothing relief. Being in the water helped lower the amount of pressure I was feeling and the warmth helped calm my sore muscles. I'm honestly not sure how long I labored there, but Sean and Bianca came in and out. I talked to them some, but also went into a almost sleep like state for quite sometime. At one point Noah came in and offered us all some of his Easter candy. He'd been so sweet my entire labor and at one point, earlier, had even climbed into bed with me and rubbed my back and said to me, "Mama, no one should hurt on Easter." I, of course, reassured him that I was alright and the noises just helped me to relax. After a while in the tub, I started becoming unable to get comfortable during the contractions and the bath just wasn't working anymore. Bianca helped me out and with some difficulty I went to the bathroom again before heading back to the bedroom. Once there, they helped me get dressed in what I had chosen for the hospital and helped me try to get comfortable. I tried the ball and that worked extremely briefly so I went to side lying. During my breaks I felt myself become deeply still and quiet. But during, I was getting very loud and it seemed nearly impossible to relax through these contractions. The abdominal breathing was becoming quite challenging and I would find myself pushing my hands into the wall with all my strength. Bianca or Sean would rub my back and encourage me to try to relax. It was very intense and I remember going inward and praying for strength and asking that it wouldn't be more than I could handle. A few minutes later, after a very strong contraction, I went into a deeply relaxed state. I'm still not sure if I slept very briefly or not, but my breathing became very shallow and quiet. I'm honestly not don't know how long that went on, but I'd guess about ten minutes or so. 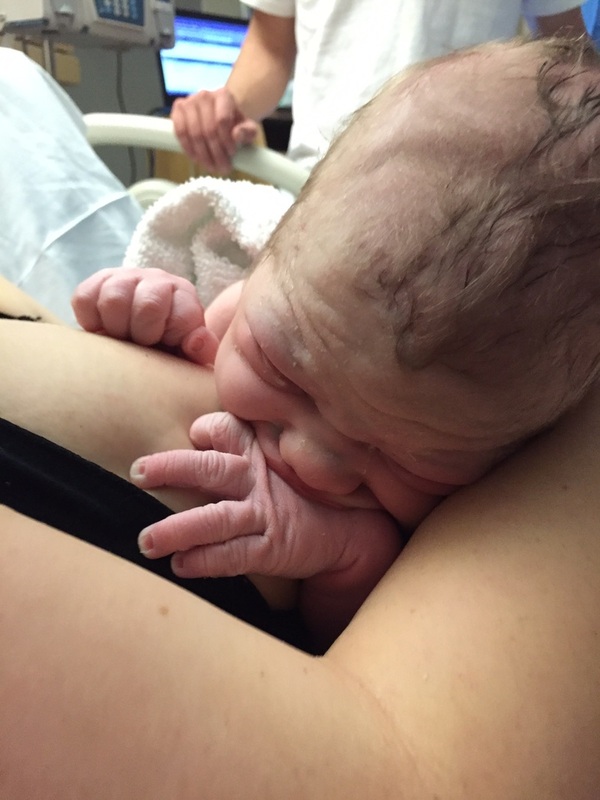 During the contractions that followed, I found myself moaning deeply and then going into an almost grunting sound. I remember hearing Sean say something to Bianca and thinking to myself that this had been transition and remembering that the grunting was usually because it was beginning to become time to push. This happened a few more times and Bianca asked me if I could get up to go to them bathroom again. I found it hard to answer her and remember nodding but feeling the total lack of desire to get up. I think she knew it was about time to go and was gauging my reaction. I did manage to get up to go, which went on through several strong contractions of leaning on the counter, then trying to go to the bathroom, then leaning once again. As I came back into the room, I'd have to stop and lean completely into Sean while Bianca applied counter pressure to my hips and back. At that point I told them it was time to go. They agreed and Sean loaded up the last few things. They had to support me standing while I was getting ready so I could pause through things frequently. We finally were ready and told Noah goodbye. The car ride was rough but fortunately we were only a few minutes from the hospital. We did get a couple red lights that seemed like they took hours to me. We arrived around 11:00pm and Sean helped support me as we walked in. We got to the door right as a contraction hit. So, I leaned on Sean and Bianca provided counter pressure on my lower back again. A woman who was leaving saw this and offered to go get me a wheel chair, which I declined. Sean chuckled and nodded thanks. We continued on this way as it was quite a hike to get to labor and delivery. Once there, they told the tech I was in labor and she brought a nurse over. The nurse asked me about my contractions and how long I had been in labor. I told her it had been twenty four hours. She said they'd need to put me on a monitor and check me to be sure I was in labor. I expressed some type of irritation at this, in between groans, to which she assured me I wouldn't have to walk again. I told her that wasn't the problem, I did not want to go in that room and get strapped to monitor, much to Sean's amusement.They insisted and that had to be the worst part of my whole labor. I lost my rhythm and was hanging on the bed rail tensing my entire body. I let them know I was feeling pushy before they checked me, but the nurse informed me I was at 8+ and told me not to push. Any mother that's given both naturally knows that when your body is pushing you cannot simply not push! So, I was trying to fight something completely overwhelming whilst making it through contractions which I should have been trying to relax through. Sean and Bianca helped me move to lean on the raised back of the bed in a kneeling position, for more comfort. They wheeled me down the hall to the room, and reminded me again not to push, before leaving to call the doctor in. Bianca reminded me quietly of what I so firmly believed. Your body knows what it is doing. My body wouldn't being pushing if it wasn't time. So, I didn't fight it anymore but just tried to relax through it. The doctor arrived shortly and asked if I'd like to be checked to see if I could officially push. I told her I didn't want to be checked again but, if that's what she wanted to happen before I pushed, then I'd do it. She told me she could break my water at this point to make this stage shorter since baby was already moving down. I asked Bianca her thoughts and I decided I was alright with that at this point. She checked and told me I was already complete, which we knew, and proceeded to break my water. Sean and Bianca helped me turn back to kneeling and leaning on the back of the bed to push. I had wanted to squat, but had dealt with pelvic separation and Bianca had suggested this position. Pushing was the most intense, most incredible sensation I've ever experienced. So much pressure. I pushed a bit hesitantly with two contractions and could feel him come almost to crowning and slide back. I did feel the strong, stinging sensation that is referred to as the ring of fire, but it wasn't as awful as that moniker makes it sound. You are kind of between a rock and a hard place though. You've got to push through the hardest part to get to the relief. Sean was at my right side holding my hand and lovingly coaching me. Bianca was on my left applying counter pressure to my perineum with a warm, damp cloth which did make a big difference! I decided that with the next contraction I was going to give it everything I could muster and thought of what it would be like to hold our precious son. I felt it begin and I pushed him from crowning to head out and as the contraction ended the doctor told me I needed to keep pushing. I told her I couldn't as I didn't have the urge but Bianca encouraged me to go ahead if I could. I did and I felt him turning and his shoulders and then body slipped out. Bianca told me later that there wasn't full dystocia, but that he seemed to have gotten stuck there for a moment. Sean said he thought it was so amazing how his head came out and he stayed there quietly for a moment, as though he hadn't realized he was out yet. Then once his toes came out his eyes popped open and he began crying instantly. The relief was immediate and I heard the most emotional, life changing sound any parent ever hears as our tiny boy began to cry! The sound I'd been dreaming of since my pregnancy began. Sean and Bianca helped me turn around to sit and Declan Joseph McGinness was placed on my chest. He was amazingly beautiful and I felt the most overwhelming flood of joy, accomplishment and most of all love. Love for my sweet husband and for our newborn son. The feelings I had not wanted numbed! He hung out at the breast for a while, trying to figure out where his hands were supposed to go, and then began to nurse. We waited about twenty or thirty minutes for the placenta to be born, at which point the doctor checked on it and said it was right there and gently slid it out. She then had Sean cut the cord, then Bianca and I sat and talked while Sean watched Declan be weighed and examined. They were all amazed by how bright and alert he was. Looking directly into our eyes from birth. 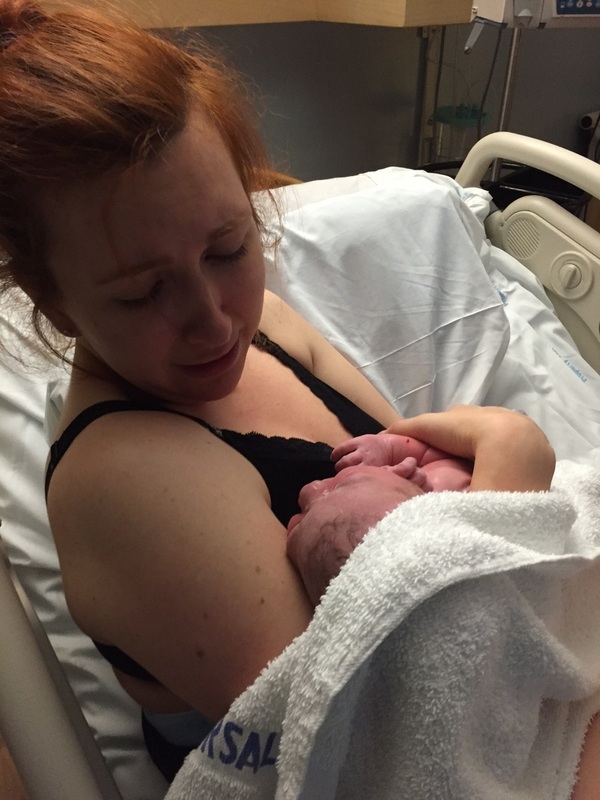 I still feel elated thinking about Declan's birth. It is truly the single most incredible thing I've ever experienced. During labor you have to push through the most challenging journey of your life and overcome that to learn your own strength and it is amazing what you can achieve if you simply trust your body and yourself and you don't give into fear. Though birth can be incredibly difficult, I wouldn't describe any of the feelings I experienced as being pain, but more discomfort and intense sensation. I was never given more than I could handle at any point. The reward at the end was greater than I could have ever imagined.